The common way of making steel bar is to heat the steel to a high temperature and extrude it through a die into a bar shape. When the steel is cooling down the outside of the bar will cool down at a greater rate than the inside, the temperature gradient causes a difference in the metallic structure which means that the material on the outside can be porous. Even though its not easily visible to the human eye, if you were to put non-machined bar under a microscope you will see thousands of tiny holes. This can encourage entrapment of chemicals in the tiny pores. At first you may see no signs of corrosion, but as time goes by the pores can act as corrosion sites and you will see little white specks all over the component. This is the zinc corroding. When we process the steel it has to go through a degreasing and acid stage before being zinc plated, if it’s just a clean mild steel bar that we are processing under our straightforward procedure then the pores would not be made significantly bigger and you would be less likely to experience the problem later on down the line. The problem is considerably exacerbated when we receive work that is a mild steel bar material with a piece of black steel welded to it, because of the black steel we have to pickle it in hydrochloric acid for much longer than our normal procedure to clean the welds and the black steel. If non-machined bar material is left in the hydrochloric acid for more time than our normal procedure the pores on the bar will get even larger thus encouraging entrapment of chemicals in the tiny pores. If you imagine that the pore is a hole full up with water, the oxygen levels will be higher at the top of the hole compared to lower levels of oxygen at the bottom of the hole - this is known as differential aeration. For corrosion to take place, 3 factors must be present. In this circumstance 1 and 2 are caused by the differential aeration and 3 will be caused by moisture in the air. This in turn leads to corrosion. This means that even a ideally applied zinc plated item, will quickly corrode if these holes are present. The best solution to this problem would be to buy larger diameter mild steel bar from your metal supplier and machine off the outer layer. (the machine stock allowance) This would eliminate the problem at source. The next best solution would be to rub down the steel bar with wet and dry abrasive paper after the hydrochloric stage. 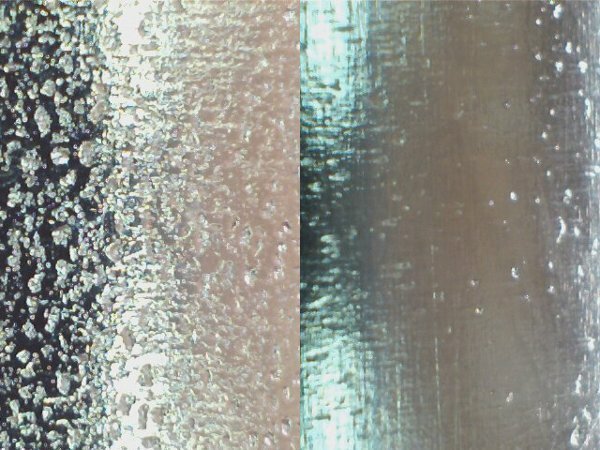 We have extensively trialled this and looked at the material under a microscope before and after rubbing it down, the results were very good when rubbed down after the hydrochloric stage and the surface showed visible improvements and less porosity. Finally the last and least effective solution would be for the engineering company to rub down the steel bar prior to zinc plating. We have also trialled this with wet and dry and it does improve the surface of the bar but the problem could still happen with this method. However this would be better than doing nothing at all. Without doubt the best solution to this problem would be to machine of the outer layer of the steel bar to the machine stock allowance. Metal suppliers cannot guarantee the surface finish of the material of the steel bar until the outside is machined to the machine stock allowance that they set. This is a standard practise of metal suppliers. This may not been seen as a viable option for some engineering firms because this method does induce extra costs with material and labour, however this method will completely eliminate the problem at source. Even though rubbing down the component before and after the hydrochloric stage did improve the surface of the steel bar it’s still not a guaranteed solution to the problem, however in our expert opinion it is better than doing nothing at all. Please email us if you would like advice on porous bar issues. Our specialists will be able to give more in-depth information. Porous material under the microscope. Left: raw, unabraded. Right: hand abraded with P180 wet and dry paper. 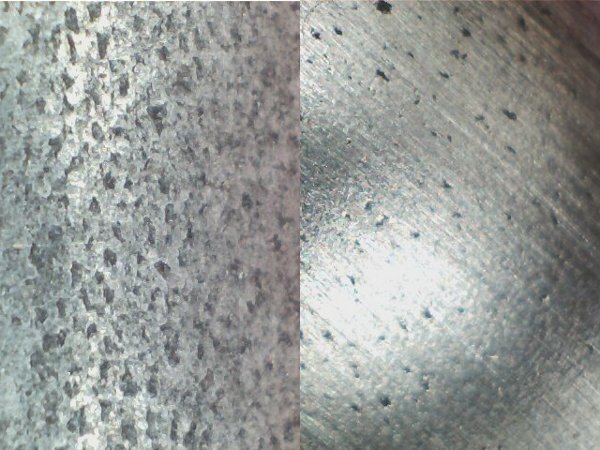 Porous material under the microscope after zinc plating. Left: raw, unabraded and zinc plated. Right: hand abraded with P180 wet and dry paper and zinc plated.